At Warehouse One, We Fit You! 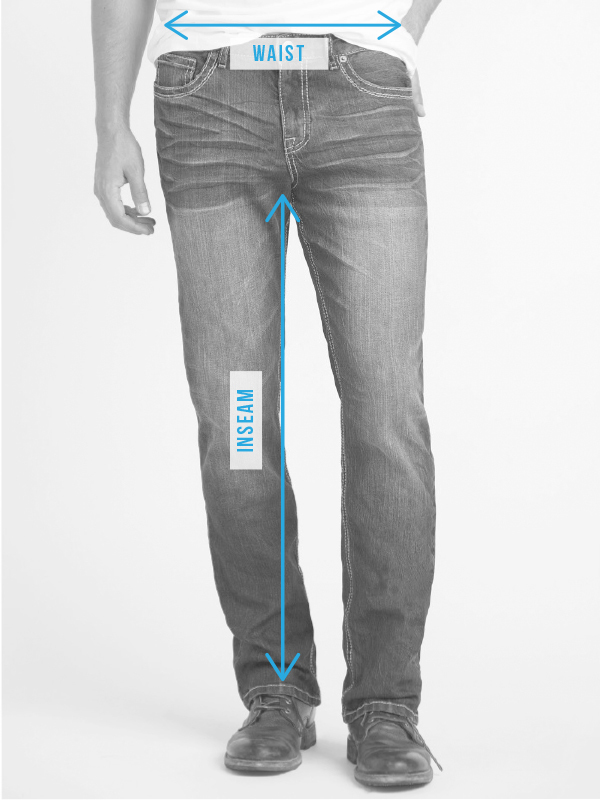 We’re proud to offer all our jeans in multiple inseams, with ladies’ jeans in sizes 24-36 and 14+- 22+, and men’s jeans in sizes 26-44. Men’s and ladies’ tops are available in XS-3XL. 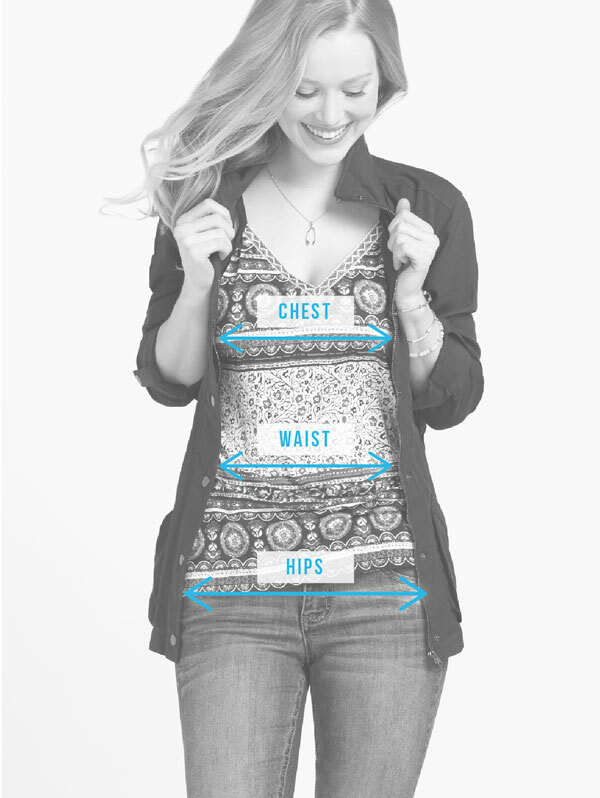 Please use our convenient fit guide to find the perfect size for you. Bust 33" 35" 37" 39 1/2" 42" 45" 48" 52"
Waist 26" 28" 30" 32 1/2" 35" 38" 41" 45"
Hip 36" 38" 40" 42 1/2" 42 1/2" 48" 51" 55"
WAIST: Measure around the narrowest part of your natural waist, generally just below the rib cage and around your belly button. HIPS: Stand with feet slightly apart and measure around the fullest part of your hips. 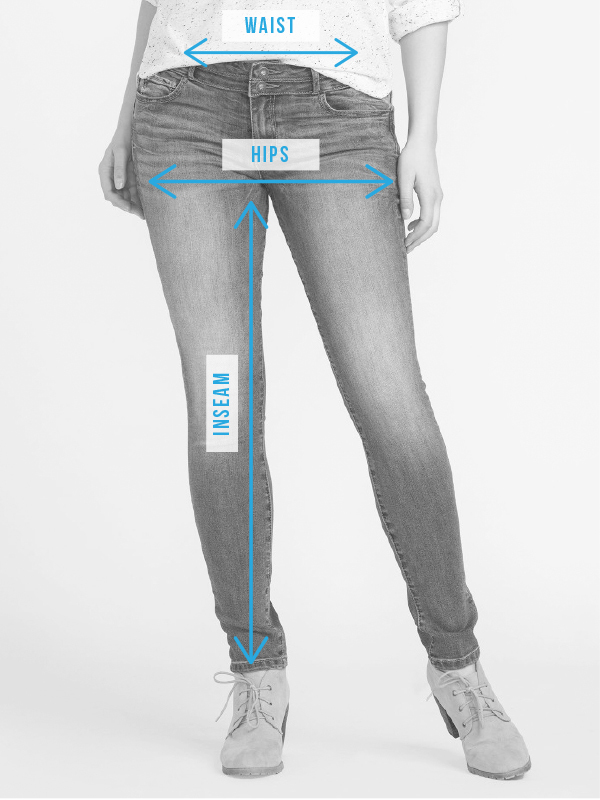 SKINNY STYLES ONLY N/A 28 ½" 31 ½" 33 ½"
ALL OTHER LADIES’ JEAN STYLES 28" 30" 33" 35"
WAIST 24" - 27" 28" - 31" 32" - 34" 36" 36.5"
INSEAM: Measure straight along your inner leg from crotch to heel. WAIST: Measure around the narrowest part of your *natural waist, generally just below the rib cage and around your belly button. NECK 13.5" 14.5" 15.5" 16.5" 17.5" 18.5" 19.5"
CHEST 36" 38" 40" 43" 46" 49" 52"
SLEEVE 32" 34" 35" 36" 37" 38" 39"
STANDARD BUTTON UP SHIRT FIT: Regular fit through chest and shoulders. RELAXED BUTTON UP SHIRT FIT: Broader cut through the shoulders, waist and hip, making it our most relaxed fit. It is approximately 1.5" larger in the chest than our standard fit. 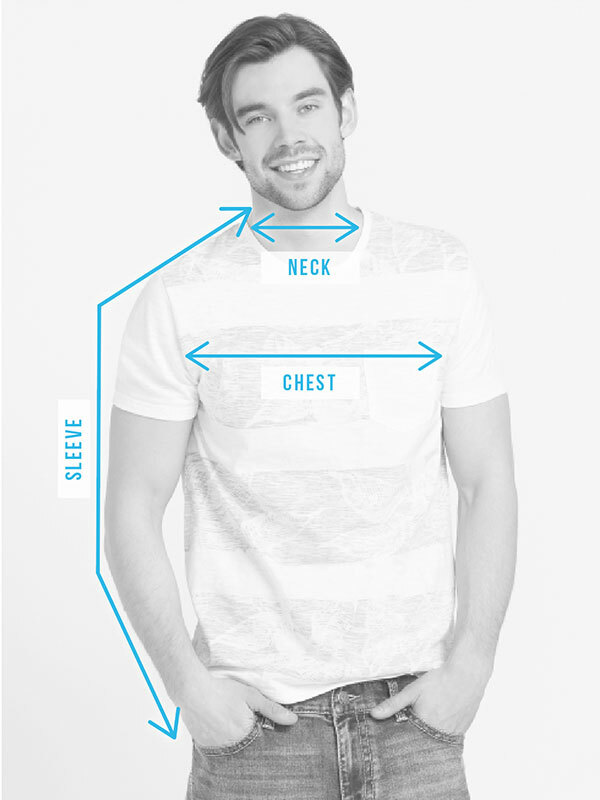 NECK: Measure around the base of your neck, keeping one finger between your neck and the tape measure. SLEEVE: Bend your elbow 90 degrees and place your hand on your hip. Hold the tape at the centre back of your neck. Measure across your shoulder to your elbow and down your wrist. The total length is your sleeve length. WAIST 26.5" 28.5" 29.5" 30.5" 31.5" 32.5" 33.5"
WAIST 34.5" 36.5" 38.5" 40.5" 42.5" 44.5"
WAIST 28.5" 29.5" 30.5" 31.5" 32.5" 33.5" 34.5" 36.5" 38.5" 40.5"
INSEAM * 33" 33" 33" 33" 33" 33" 33" 33" 33" 33"
WAIST 29" - 33" 34.5" - 38.5" 38" - 42" 41.5" - 45.5" 45.5" - 49.5"